This guide offers everything you need to know about performing the bench press correctly! The bench press is one of the most popular and widely used upper body strength and hypertrophy building movements. In this guide we will discuss the bench press, the muscles worked, and some very helpful styles and variations to not only boost your bench press, but also to help you maximize strength and muscle gains and minimize injury. Who Should Do the Bench Press? There bench press is a movement that requires upper body strength and mass. In the below step-by-step guide we discuss how to perform the barbell bench press (flat). Note, that the amount of arching in the bench press is highly specific to sport/goals. In the below section we discuss general bench press set up, which is often applicable to most individuals. If you are a powerlifter looking for powerlifting specific bench press technique, be sure to take a look at how to increase your bench press in powerlifting. Setting a strong base is key for the bench press. To do this, lie flat on a bench with the feet gripping the floor (heels underneath the hips). The glutes and upper back should be firmly attached to the bench pad. Once this is done you can set your shoulder-blades together and down the back. The grip should be slightly wider than shoulder width for the standard barbell bench press. Note, that the amount of arch in the lower back will vary based on goal, however the more arch the more leverage a lifter has on the barbell. Leverage is good for lifting heavy weight in competition, but may not actually be what is wanted when trying to develop the chest itself (muscle hypertrophy). For starters, think about an inch or so between the lower back and the bench. Coach’s Tip: Squeeze the barbell hard and stack the wrists (rather than bending them back). This should add stability to the wrist and allow you to activate your lats as you pull the shoulder-blades tighter together. Once you have you have unracked the barbell, focus on trying to snap the barbell so that the knuckles stay upwards and the back muscles are tense. This is the identical end position in the bench press. In this step, you should feel like the loading is pressing your shoulder-blades and upper back into the bench. Coach’s Tip: Do not allow for any movement of the torso, feet, or upper back in this position. It’s imperative to be stable and strong. By pulling the barbell (under control) the the base of the chest, you allow the lats to engage and offer stability and strength in the movement. To do this, think about pulling the barbell to the base of the chest, allowing the elbows to become tucked into the ribs (not necessary touching, but in on a diagonal). The better you can stay active with the lats in this phase the better your ability to press the load up will be. Coach’s Tip: Squeeze the bar and pull it to the body. Once thee barbell has made it to the base of the chest/sternum), you need to reverse the direction of the bar path. Some sports require you to pause on the chest, and others do not. To initiate a strong pressing of the barbell, it is helpful to think about pressing yourself deeper into the bench, rather than thinking about how you need to move the barbell upwards. By actively pushing yourself away from the barbell, you ensure that you will maintain a strong base and connection to the floor/bench. This will ultimately help you produce grater amounts of force (and exert it upon the barbell). Below are some of the key concepts one should grasp about bench press training how it can relate to enhancements in general fitness and sports performance. The bench press is a potent upper body mass building exercise that stresses some of the largest muscles in the body. The chest, triceps, and even back can be trained with high volume and intensity with the classic lift. Increasing muscular size and density can lead to enhancements in strength and performance capabilities as well. The bench press is one of two pressing movement patterns (the other is vertical pressing). 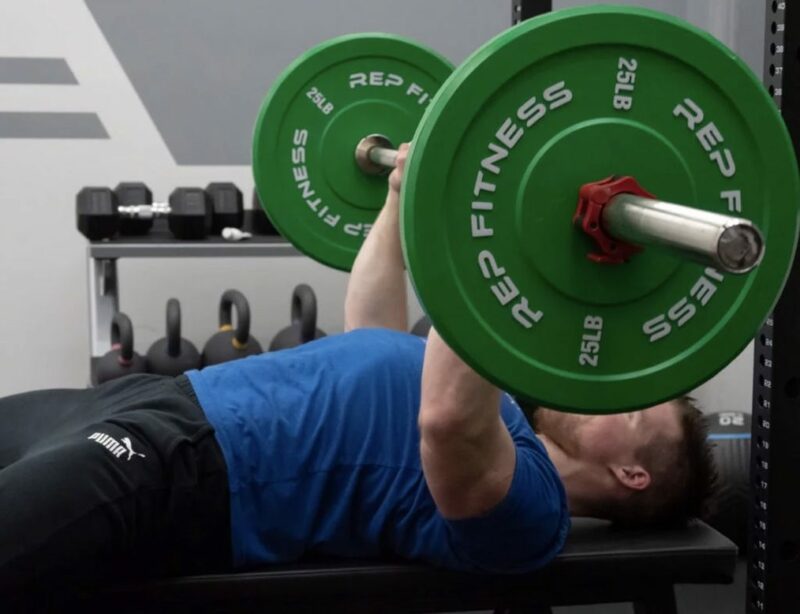 By using the horizontal pressing (bench pressing and all the variations below) one can maximally induce strength development through the upper body chain. This is useful not only for a bigger bench, but can increase performance overhead and movements in front of the athlete (combative and formalized sports). Whether you are powerlifter, strongman athlete, fitness and CrossFit® competitor, or even an Olympic weightlifter, increased muscle mass and pressing strength can be key to sports performance. Powerlifting and strongman competitors must perform pressing in competition (the bench is one of three lifts for competitive powerlifters) greatly relying upon upper body pressing strength. Other athletes rely heavily lockout and pressing strength performance during overhead and supported positions (jerks, dips, snatches). Additionally, the increased upper body mass could be beneficial for rack positioning and performance in the front squat and clean, however athletes must remain mobile and supple in their movement abilities. Who Should Perform the Bench Press? 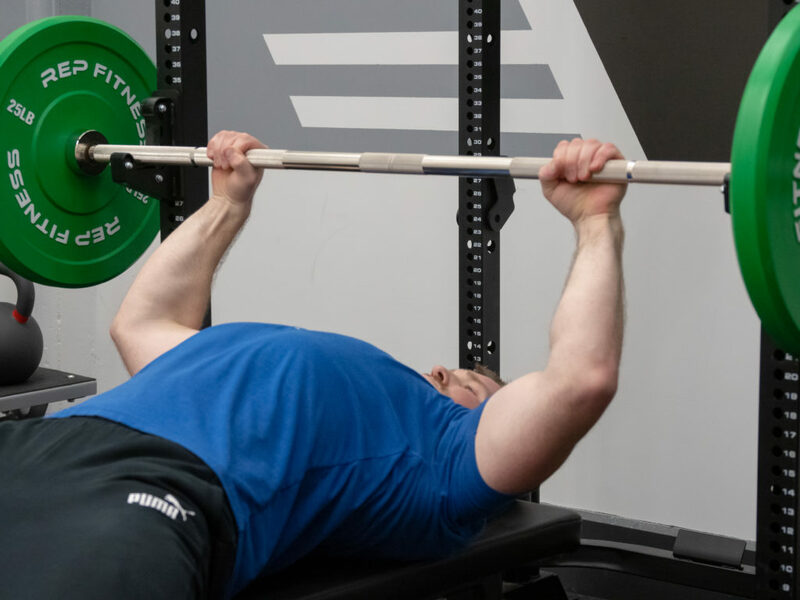 The bench press is a versatile movement that can be done with barbells, dumbbells, and specialty bars to increase upper body strength, hypertrophy, and sport specific performance. Below we will discuss what types of athletes can benefit from the bench press, and why. Strength and power athletes use the bench press to increase overall strength, add quality muscle mass to the chest and triceps, and improve sport specific performance. Powerlifters: The bench press is one of the three competition lifts (squat, bench, and deadlift), making it vital to perform for powerlifters. While this is not to say that powerlfiters shouldn’t perform other pressing variations and alternatives (take a look at the below sections and graph), it is strongly urged that powerlfiters master bench press technique to maximize sport performance. Strongman Athletes: Similar to powerlifters, (with the exception that the bench press is not a lift performed in competition), the bench press is often used to increase overall pressing strength and muscle mass. This, in addition to push presses, jerks, single arm presses, etc all hold a valuable place among upper body strength training exercise for strongman athletes. Weightlifters: Olympic weightlifters can use the bench press to increase overall pressing strength and add upper body muscle mass (chest, triceps, shoulders), especially with lifters who may lack upper body strength/size. While there is not a sport specific movement in weightlifting that is similar to the bench press (as weightlifting is an overhead sport), it can be integrated for such purposes as general upper body strength and hypertrophy training. The bench press can be used for most individuals looking to increase chest and pressing strength and upper body muscle hypertrophy. It is important that lifters master proper bench press technique and add a variety of dumbbell variations, bodyweight push ups, and other pressing alternatives to maximize performance and muscle growth while avoiding overuse injuries to the shoulder and wrist (often the case with individuals who bench incorrectly or too frequently). Below are three primary training goals and programming recommendations when programming the bench press into workouts. Note, that these are general guidelines, and by no means should be used as the only way to program the bench press. Generally speaking, the bench press should be done earlier in a session if the primary emphasis is on upper body strength and/or muscle hypertrophy. However, like most training programming, muscle hypertrophy and endurance work often occurs after power and strength exercises. There is a wide variety of repetition schemes and variations that can be used to increase strength. 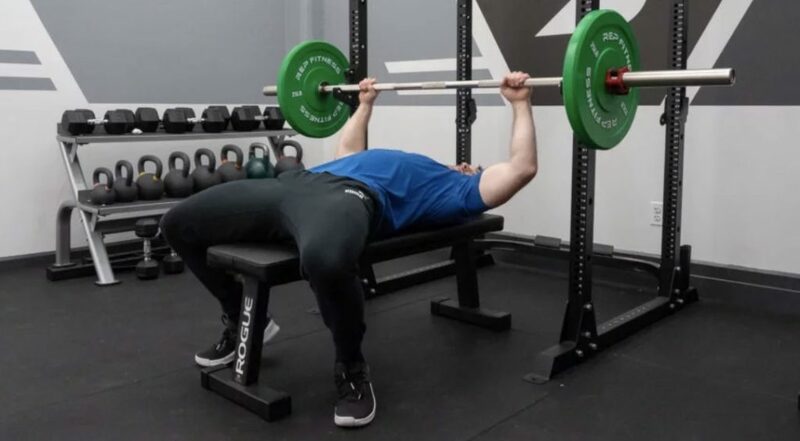 For some lifters, pauses and pin presses can be used to address concentric strength limitations or issues throughout certain ranges of motion in the bench press. In addition to higher volume, heavier loaded presses, tempos, drop sets, and other training variations can be utilized to increase muscle damage and induce muscle hypertrophy. Below are four (4) barbell bench press movements that can be done to increase overall bench press strength, address limitations, and increase muscle mass of the chest and triceps. 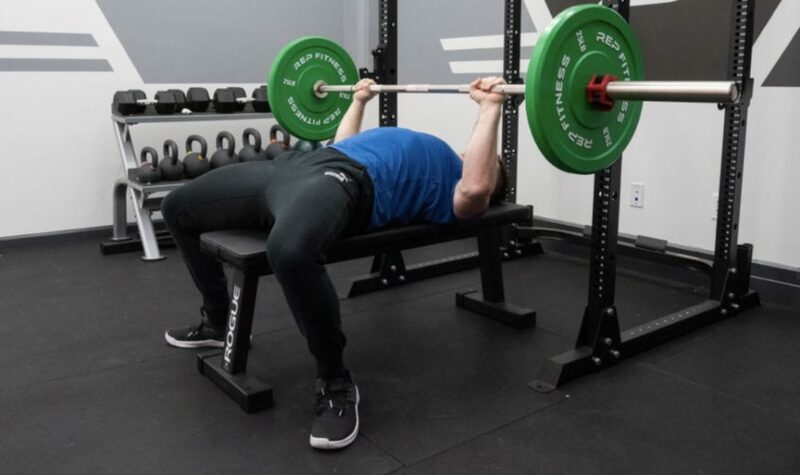 The pin press (also very similar is the board press) can be done to increase strength at a specific sticking point throughout the bench press range of motion. Similar benefits to the floor press or the rack pull for deadlifting, this movement can be done to address weakness in certain ranges, add hypertrophy and stress to particular muscle groups, and even limit movements for cautious athletes with injuries or special considerations. The floor press, which can be done with bars or dumbbells, is a bench press variation that has a lifter assume a lying start on the floor. By perfuming the press on the floor vs the bench, the range of motion is decreased, placing a much greater load on the triceps and chest. 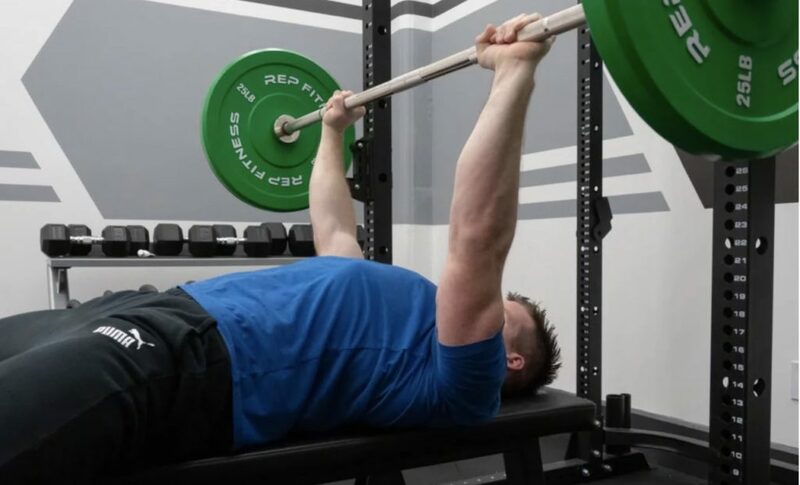 This partial bench press movement can be beneficial for added muscular hypertrophy to those muscle groups, lockout strength, or a variation to allow pressing with athletes who may have shoulder injuries or precautions. The incline bench press, which in this case with the barbell, is a good exercise variation to increase strength and development of the upper pectoral muscles, triceps, and anterior shoulder. This exercise can also be done with dumbbells. The fat Bar is a variation (either using Fat Gripz of fat bar) that can increase grip strength and stabilization of the arm and shoulder during the press. By doing so, less ability to compensate with excessive extension of the wrist (due to the fat grip) can lead to better elbow and shoulder joint function, increasing emphasis on the triceps and chest. Below are three (3) bench press variation that do not include a barbell, which can be done to increase unilateral strength and hypertrophy or add variety to a training program. The dumbbell bench press can increase muscular development and performance for pressing athletes and general fitness. By training with dumbbells, you allow for greater range of motion (increases stimulus), unilateral development, and can better adjust the angles movement patterning to best fit every athlete’s anthropometric differences at the shoulder. While this is not a “bench press” variation, the ability to perform push ups is critical for bench press performance. Without the ability to support oneself on the push up can lead to injury and weakness in supported pressing pressing styles. This pressing style has a lifter use a Swiss bar to perform the movement, which differs the angle of the hands on the bar (and width). By doing so, the stress on the shoulder is decreased, with a large increase in triceps and pectoral development. Similar to the floor press, this can be used for strength and hypertrophy specific to those groups, lockout performance, and precautionary measures for those with shoulder concerns. Take a look at some of our top content to improve your mobility, strength, and overall muscular development specifically for a bigger and stronger bench press! Is Arching Your Lower Back in the Bench Press Cheating?